1.The camera is waterproof camera, battery compartment design is very tight, open requires skill. Please check the youtebu video: https://youtu.be/f4ayegplm8o. Underwater Camera for Multi function:The underwater camera is built tough for your active lifestyle. It’s waterproof-submersible up to 10 feet-dust proof, and shockproof. 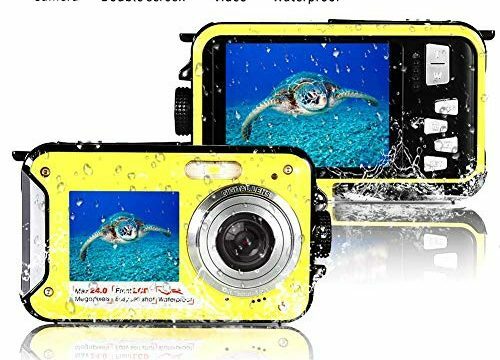 The waterproof camera support flash light, anti-shake, face detection, smile capture, self-timer .It’s the perfect travel companion, ready to capture all your adventures and fun selfies-even under water. Mountain mode :You can adjust the focus with the knob on the left between mountain mode (There is a mountain symbol to appear on the screen) and flower mode (There is a flower symbol to appear on the screen),and once you had it where you needed it you didn’t need to re-adjust it often at all. It can take close-up photo and it is clear and not blurry. Most of the time you can keep the knob at mountain position.